The PLIQO bag: Blue or Orange Lining? Have your say. I hope your days are going well? And apologies for another post so close on the heels of the last, I will keep it brief. A number of people have raised the colour (or color!) of the lining. I like the orange, as do many backers. However, it is a potential deal-breaker for some. I have listened and the good news is, we have a potential solution. I have contacted our factory today. Assuming we can get an order of around 500 bags through pledges to this campaign, we can run in two colours – the ‘classic’ blue (as featured in the campaign video) – and also the ‘tech’ orange featured in the still photography. If you have a strong view on colour, this will be managed in the Backer Survey at the campaign end. I’ll ask for your preferences then – it will be sometime mid-June. Hoping that is all good, but if you’ve any questions, please do post to the Comments tab so that everyone is in the loop. Thank you. 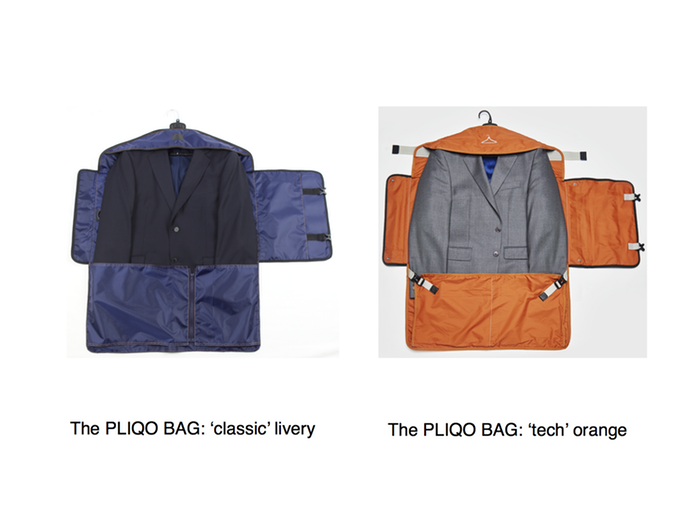 Finally, a little plug for the PLIQO garment bag. As I write we are 93% funded on this stretch target. No need for you to pledge more. However, if you have women friends, family or colleagues who might be interested in a pledge – please spread the word! Thanks again – and wishing all of you a peaceful evening!